I write this acutely aware that none of you (save for Patrick S) will ever get to try this cigar. In fact, right now I’m smoking the second-to-last of its kind. And the final specimen is resting comfortably in my humidor. It will almost assuredly be smoked by no one other than me, probably in the not-too-distant future with a serving of Four Roses Small Batch. But this is not a cigar review, and I’m definitely not doing this to brag. In the interest of cigar education—and for the benefit of those who have never had the opportunity to blend their own cigar—today I’m bringing you my findings from the blend I chose at Drew Estate’s 2014 Cigar Safari. Only ten of these cigars were made, nine of which I brought back from Nicaragua (the tenth was traded to my colleague for a sample of his blend). 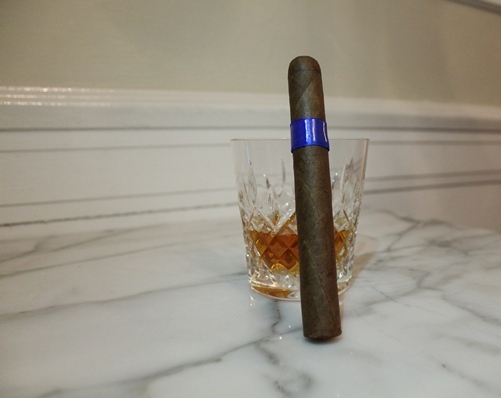 For starters, I’d like to point out this is my third blend from Cigar Safari over the past several years. In each case I chose a different wrapper. I chronicled the results of my Connecticut Ecuador and Brazilian Mata Fina blends here. Each time I’ve blended a cigar, the process has been similar. I’m presented with a menu of pre-selected, pre-fermented, aged tobaccos (so all the hard work is already done). They are organized by filler, binder, and wrapper. Based on the vitola format of my choosing, I’m told how many filler leaves I’ll need. And while barber poles and double-binders are certainly on the market these days, I’m instructed to select just one wrapper and one binder. I wrote more about this process here. Fortunately, I don’t have to actually roll my cigars. I’m just selecting the tobaccos, and the professionals do all the actual craftsmanship. A cigar bunched or rolled by my own hands would be unsmokable. 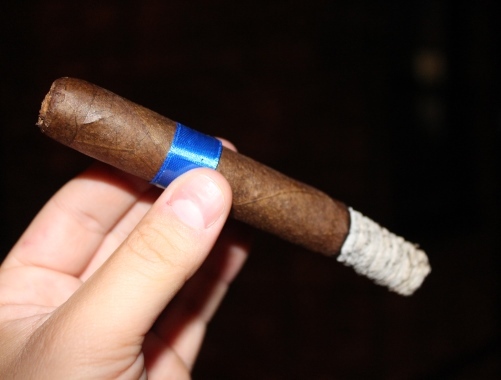 But, in true Drew Estate fashion, all of my samples exhibited perfect construction, including a solid ash, smooth draw, even burn, and good smoke production. My intention was to create a spicy smoke with equal parts saltiness and sweetness. I was aiming for the medium-bodied spectrum, counting on sweetness from the wrapper, coupled with spice and strength from the binder. The Seco was added for its fruitiness and aroma, the Viso for its richness and texture, and the Ligero fillers for their power and sharpness. I’m really pleased with the result. The profile tastes of crème brûlée, cinnamon, cedar, black pepper, and coffee. The texture is coarse—almost sandy—and the finish is long and spicy. I’d say the strength is medium to medium-full. My only concern is a creeping sour meatiness that comes and goes if you smoke too quickly. While I think this is by far my best effort to date, I’m not entertaining any delusions of Drew Estate putting it into regular production. That said, this was one of the most rewarding and educational exercises in my tenure of writing about and studying cigars, and I thank you for indulging my desire to write about the experience. Tomorrow we’ll get back to writing about cigars you actually have a chance of smoking. I think just about every serious cigar smoker entertains the fantasy of creating a personal blend. We've all imagined the flavor profile, and fill a humidor dedicated to aging gracefully just those sticks. Congrats on your success. Sounds delicious. Tell JD to make it so I can smoke it! The Drew Estate Nirvana is fantastic. Wonder if that's the same Cameroon leaf? Cheers to making blends with three different wrappers. I probably would have also chosen Mata Fina, Ecuador Connecticut, and Cameroon. Would love to experience the blending for myself.